Nirvana is the superior all-organic liquid you use as a foliar or root treatment from the start of your crop cycle to the finish. It makes clones and seedlings grow better. 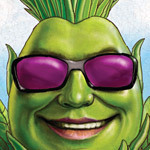 It makes vegetative plants grow bushier and ready for flowering earlier. It helps plants resist diseases and pests. Nirvana makes more flowers, bigger flowers, tastier flowers. So what does Nirvana do? Nirvana makes crops look, taste, and smell better! This is the only all-organic crop booster 100% guaranteed to give you outstanding outdoors organic nutrition and quality even when you're growing indoors! Why do I need Nirvana? Because, your plants need more than just nutrients. They need 100% organic bio-catalytic ingredients that accelerate growth and increase harvest size. Nirvana contains hormones, vitamins, amino acids, carbohydrates, minerals and growth regulators derived from alfalfa, kelp and Humic acid. What does alfalfa, kelp and humic acid have to do with it? Alfalfa provides organic calcium, potassium, magnesium, proteins, chlorophyll, carotene and vitamins. Kelp has an unequalled range of amino acids, vitamins, hormones, root stimulants and growth enhancers. Humic acid is a rich additive that improves plant metabolism, root health and harvest quality (namely the earthy flavor that humic acid provides). Nirvana's exclusive, powerful bio-catalytic formula is quickly absorbed by roots and plant cells. This means you can foliar spray Nirvana as well as apply it to the root zone. Use Nirvana during all phases of growth. However, we recommend to cease foliar spray beyond week 3. When you look at what Nirvana has In it, and how these organics work for you, that’s why Nirvana is the number one choice of growers seeking an organic way to maximize yield and quality. There’s a superstar list of ingredients on board for you, including alfalfa meal that enhances growth and yield in your hydroponics plants. Most manufacturers use acid hydrolysis, which destroys L-aminos. When you use Nirvana’s enzymatically-hydrolyzed whey protein, your plants get L-aminos that stimulate floral growth and potency. Another Nirvana benefit comes from two other plants: Chilean Soap Bark and Yucca. These amazing plants produce compounds called surfactants. A surfactant is a compound that reduces the “surface tension” of liquids so they and whatever they contain more easily enter your plants via roots and leaves. Yucca extract and Chilean Soap Bark extract are two all-natural surfactants that transfer nutrients into your plants. Another of Nirvana’s potent bud potentiator ingredients is bat guano that contains nitrogen, trace elements, amino acids, nucleic acids, proteins and minerals. Bat guano is rapidly-absorbed by plants, enhancing growth. Along with guano, Nirvana has a yeast component that contains 22 essential amino acids that build plant proteins, and it’s also loaded with B vitamins. B vitamins are particularly useful for cloning, seedlings, transplanting, motherplants and gardens where plants are being pushed hard for production. In fact, virtually every element on earth is contained in azomite. You’ll notice that many of azomite’s ingredients are essential nutrients for your plants. Another of Nirvana’s underground benefit for your plants is humic acid. It comes from leonardite, which is among the richest veins of organic material in the earth. Humic acid helps your plants intake and utilize nutrients. A related compound is fulvic acid, also derived from leonardite. Fulvic acid similarly transports nutrients into cells..
As you can imagine, it’s difficult for you to individually source or use these beneficial natural ingredients as individual supplements. For your convenience, Advanced Nutrients extracted, standardized and combined these powerful compounds into one formula, called Nirvana. Not only that, but Nirvana is triple-filtered and custom-blended you easily applied as a foliar feed or in any type of hydroponics irrigation root zone system. 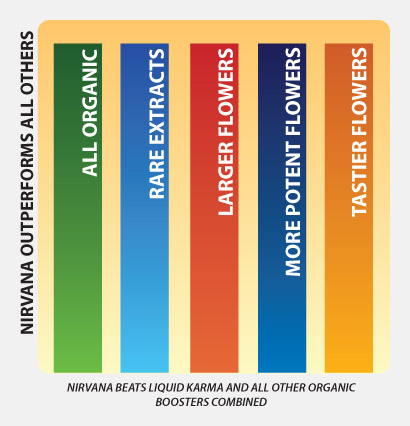 Be aware that Nirvana is often placed on hydroponics store shelves along with competing products such as Pure Blend Pro and Liquid Karma, but Nirvana contains more crop-boosting ingredients than any other organic booster product. Not only that, Nirvana is the only 100% organic, concentrated, easy to use formula of its type. In your quest to naturally enhance growth and maximize yields, Nirvana stands alone as a rich supplement that you want to feed your plants right away. I've Heard That Nirvana Is Good As A Foliar. Can It Be Left On Blooms Until Harvest Time? Nirvana has two surfactants that make it penetrate leaves to deliver flower-boosting compounds directly into floral clusters. Nirvana is all-organic, so it’s safe to leave on your flowers. However, we recommend that you mist and cleanse your floral clusters with pure water just before harvest as a general way of creating the cleanest end product. Does Nirvana Do Anything To Improve Taste And Aroma When Using It In With Synthetic Fertilizers? One of the main effects of Nirvana is to add an organic, natural component to synthetic feed programs. Many growers report the improved taste and aroma when they use Nirvana.